One of our readers was browsing Google Play recently, hoping to find an updated version of the Google Zeitgeist application for 2013. Instead, he stumbled upon 100 According to Google, which is essentially the same thing as the Zeitgeist app, since it gathers the most trending topics from the year of 2013 and then puts it in an easily enjoyable/digestible form. The overall feel of the app is quite nice, as the landing page itself reminds us of the Android 4.4 easter egg look. It’s essentially a massive collage of pictures of celebs, artists, and events that lead you to their respective topics. When you select a topic, the UI spiderwebs out to show related topics. When you select one topic, you simply scroll down the page and view each of the major subjects that took place in 2013. For example, in technology that year, Samsung launched the Galaxy S4, which was the fastest selling smartphone Samsung ever produced, selling 20 million units within just two months. It also covers sports, music, movies, and all of the other major trends from the year. 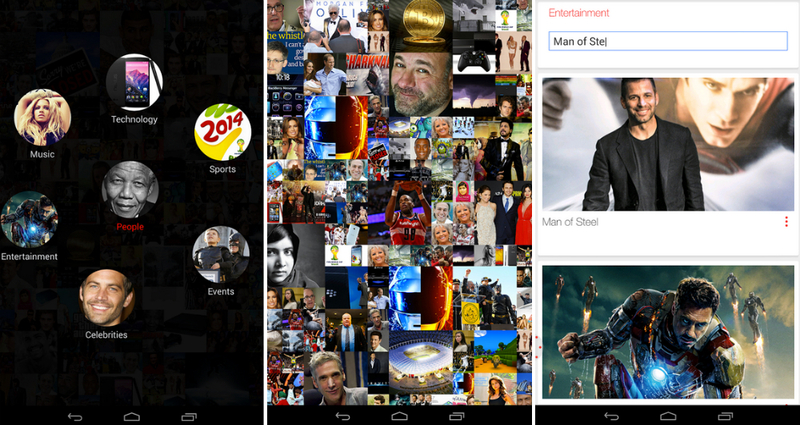 If you like reminiscing, then this app is for you, at least until Google updates its own Zeitgeist app.